Principles of Finance Featured: Boundless Finance: "Chapter 8, Section 2: Portfolio Considerations"
Boundless Finance: "Chapter 8, Section 2: Portfolio Considerations"
Weighting is the percent allocation a particular investment type receives within a portfolio. Diversification is the idea of spreading a portfolio across different classes of investments with a target weight attached to each class. 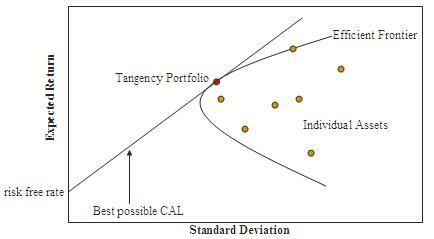 Modern portfolio theory is the idea that for any investment objective, there is an optimal mix of investments that can maximize expected return subject to a specific risk threshold. Systemic risk is the risk that applies to a particular market or industry. It cannot be diversified away. Specific risk is the risk that applies to one particular investment within a market and it can be diversified away. Refers to the risk common to all securities which cannot be diversified away. In finance, there are two types of risk – systemic risk and specific risk. Systemic risk is essentially the risk that the markets will experience in a downturn and all investments within that market will be negatively affected. It is difficult to reduce with diversification. Specific risk is the risk associated with one individual security. It can be diversified away. Let's go back to our Ski/Snowboard example. Let's say that you pick one resort to invest in, and cross your fingers hoping for a huge snowdrop this winter. It turns out that the winter sets records for snowdrop across the state of Colorado and as an industry, the resorts turn record profits. Unfortunately, your snowboard friend didn't tell you that the resort you picked still hasn't upgraded to the high-speed chairlifts, and they also don't plow their roads very often. It turns out that while all the other mountains were turning huge profits, your investment actually lost 10%. The risk associated with the one mountain is called "specific risk. " The risk of bad weather, in this example, is systemic risk. If you had taken your money and divided it up across all of the ski resorts in Colorado, you would be up 15%, but because you happened to pick the one bad egg, you lost money. This example explains why investors are often choosing mutual funds and exchange traded funds (ETFs) over individual stocks and bonds. Mutual funds and ETF's invest in underlying pools of investments specific to a particular investment objective. These objectives can range from specific to one particular industry to something that achieves a balanced portfolio of blended assets. The idea of eliminating risk by spreading investments across pools of underlying stocks and bonds is called "diversification. " A diversified portfolio spreads investments across all asset classes with a weighting system that takes time frame and risk tolerance into account. The "weight" is the proportion of that portfolio assigned to one category. In our example. we talked about diversifying away the risks of slow chair lifts but in reality, there are many more aspects to diversification. Look at the pie chart below. How many pairs of antonyms can you find? The expected return of a diversified portfolio is the expected return of each of its underlying investments times the weight the investment receives. Asset allocation is a theory of designing a portfolio that achieves a weighting scheme with a target mix of different asset classes that is suitable to the time frame and risk tolerance of the investor. The principals that support the theory of asset allocation are the cyclical nature of investments within a particular class of assets and weaker or even negative correlations that often exist across asset classes. When you re-balance your portfolio after it has deviated from the original target mix, you are selling classes that have relatively appreciated in order to buy those which have relatively depreciated. If you believe that markets go in cycles, you should believe in selling assets that have relatively appreciated and buying those which have relatively depreciated. The primary goal of a strategic asset allocation is to create an asset mix that will provide the optimal balance between expected risk and return for a long-term investment horizon. Asset allocation is the theory that any portfolio should have a set of target weights for different asset classes based on time frame and risk tolerance. There are two key principals at work in this theory. The first is that everything goes in cycles and the second is that often when one things is ebbing, the other is flowing. Let's make this very simple and say that bonds return 4% in a bad year, 6% in an average year, and 8% in a good year, and stocks return -5% in a bad year, 10% in an average year, and 15% in a good year. Stock have cycles and when stocks do well, bonds are more likely to do poorly and vice versa. Let's say we have a portfolio of $100,000 that has a target mix of 60% stocks and 40% fixed income and, therefore, has $60,000 in stocks and $40,000 bonds. Stocks have a good year and bonds have a bad one, and now we have $69,000 invested in stocks and $41,600 in bonds. At this point, we have a total portfolio of $110,600 and an asset mix of roughly 62% stocks and 38% bonds. We began with a target mix of 60-40 but since the equity market fared better than fixed-income market, we are a little off-balance. So how do we fix that? We could sit and wait and watch what happens, or we could shift $2,640 from our equity position to a fixed-income position. Remember, things go in cycles, so we expect that if stocks do well relatively to bonds that sometime in the future, bonds will do well relative to stocks. By shifting $2,640 from our equity position to our fixed-income position, we are essentially selling stocks after they have appreciated (at a high) and buying bonds after they have failed to appreciate (at a low). Look at how the different asset mixes fare, based on a 10-year period that is consistent with historical averages. Assuming rebalancing, the expected return of a diversified portfolio is simply the expected return of each of its underlying investments times the allocation weight the investment receives. The theory can feature different strategies, including strategic asset allocation, tactical asset allocation, and others, but the ideas are the same as the implications for return. A portfolio should consist of a variety of classes of assets to take advantage of zero and negative correlations between those classes, and it should be designed to achieve a target mix of assets that are rebalanced when one grows in relation to another. A diversified portfolio containing investments with small or negative correlation coefficients will have a lower variance than a single asset portfolio. Portfolio managers often target a mix of assets across different categories that maximize potential return and limit specific risk. Portfolio managers choose from many more classes of assets than the two that have been used primarily for this chapter. With historical data, powerful software and a proficient financial analyst, a correlation matrix can be produced that helps portfolio managers make investment decisions that will limit the portfolio's overall risk and exposure to market downturns. A matrix that shows a set of correlations between two random variables over a number of observations. A primary reason for a diversified asset allocation is the fact that markets often sway away from each other, and it can be beneficial to have a portion of your holdings invested in bonds in years when stocks do badly. As you can see from the graphic below, there is still considerable risk to an investor who is heavily invested in stocks, even with a blended portfolio. Remember that in 2000, the Nasdaq lost 39.28% of its value (4,069.31 to 2,470.52) and in 2001, the Nasdaq lost 21.05% of its value (2,470.52 to 1,950.40). Had your portfolio consisted of a set of stocks that approximated the Nasdaq index, you would have lost roughly 52% of your portfolio's value (from 4069.31 to 1950.40). commodities : precious metals, broad basket, agriculture, energy, etc. A fundamental justification for asset allocation (or Modern Portfolio Theory) is the notion that different asset classes offer returns that are not perfectly correlated, hence diversification reduces the overall risk in terms of the variability of returns for a given level of expected return. Asset diversification has been described as "the only free lunch you will find in the investment game". Academic research has painstakingly explained the importance of asset allocation and the problems of active management (see academic studies section below). Although risk is reduced as long as correlations are not perfect, it is typically forecast (wholly or in part) based on statistical relationships (like correlation and variance) that existed over some past period. Expectations for return are often derived in the same way. A diversified portfolio containing investments with small or negative correlation coefficients will have a lower variance than a similar portfolio of one asset type. This is why it's possible to reduce variance without compromising expected return by diversifying. ◄ Boundless Finance: "Chapter 8, Section 4: Risk"